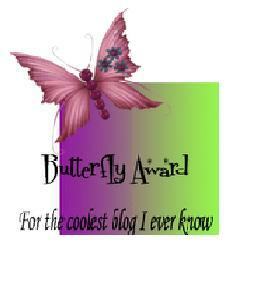 This award comes complete with this adorable butterfly and some responsibilities. 2. Share 7 things about yourself that people probably don't know. 4. Award this to 7 bloggers that you feel are deserving. 1. I love sweets and hate clutter and cannot have either in my house at any time or that will be all I think about, and it will make me feel edgy and unsettled and perhaps even just a little bit mean until the culprit disappears. 3. I faint when I give blood (which I am no longer allowed to do), when I smack a joint (and I'm pretty clumsy), and when it's too hot out and I haven't drank enough water. 4. I wrote a letter when I was 10 to the Canadian government to request the ban of seal hunting. 5. I talk in my sleep. 6. I went to school for journalism (1 year), accounting (1 year), early childhood education (1 year,..do you see a pattern here? ), chemistry (finally graduated) and nursing (yes, graduated this time too). I could go to school for the rest of my life; I love learning things so much. 7. I am a HUGE Boston Bruins fan. HUGE. No, seriously HUGE. Favourite pet, black or white? curling up in bed with one cat at my chest, one at my lower back, the dog at the foot of the bed, and hubbie's leg across mine. Sweet contentment. I laughed out loud at your running out of wine fear. That's a serious anxiety at my house - under normal, non-knocked-up circumstances of course. Michael Buble is a stud. I knew you must have some wild dog in your lineage. Second glass with dinner is normal. Depending on how many courses, so is a third. If you haven't finished the bottle by the time you've gone to bed, that's just wasteful. Great job on your award post!!! I am impressed that you have been to school so much!! Congrats on your award Terry. I love your everyday attitude. Thanks for mentioning me. Congrats on the award and thank you for awarding me with it! So honored! I also talk in my sleep and like green! And love creme brulee!